Good public speaking and powerful presentation skills are essential tools for effective persuasion. Persuasion skills are the ability to influence, convince, negotiate and sell — something all of us will need at some point during our lifetime. And I'll bet that most of have been in situations where we've had to say a few words in public but got cold feet. Public speaking consistently ranks as the number one fear for most people — outranking even death. The reason public speaking is considered to be the greatest fear is because when people are in front of an audience and unable to perform, they feel humiliated and rejected, and their self-esteem lowers. The good news is that public speaking is a learned trait and can be mastered. 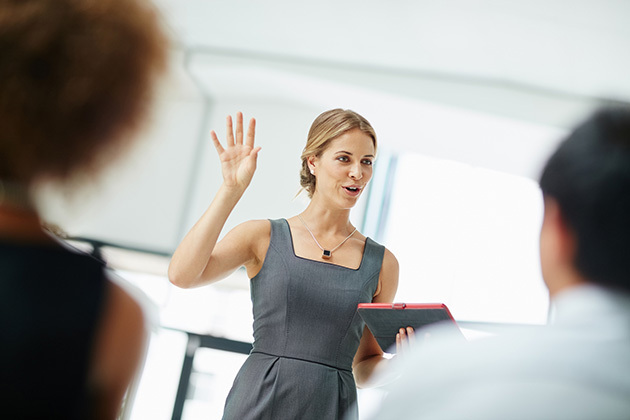 Just like learning to ride a bicycle, you can learn to master the art of public speaking. The best product or service, if not presented properly, is useless. There are many advantages to being a powerful speaker: you are perceived as a leader and an expert in your field; you gain respect; and you can leverage your position effectively. 1. Flair — When you are on the platform, your presentation must have pizzazz. Even if you are not an entertainer or a performer, your presentation should not be bland. A bland presentation becomes dull and monotonous. It must have that zing. It must be lively. 2. Flow — There must be a structure to your presentation, otherwise people lose track. Without a proper flow, the message gets lost, which results in utter confusion. 3. Facts — Whatever you say from the platform goes into public domain. No matter what you say, you must have your facts right in order to gain credibility. 1. Clarify expectation in advance. Know the end result and what should be achieved upon completion of your presentation. The clarity of the end result should decide your contents. 2. Do not make more than three points. Less than three is too little; more than three is too much. Don't question the power of three. Somehow, three points stick. It is an odd number, odd numbers stick better than even numbers. 3. Use simple language. Keep your presentation at sixth-grade level. Use simple day-to-day words that can easily be understood. Don't use jargons, slang or difficult-to-understand words. The idea is to express and not to impress. An impressed audience is a natural outcome of a good presentation anyway. 4. Be yourself. Don't pretend and put on a false mask. Just be honest and sincere. Being yourself does not mean that you become casual. Being casual displays indifference or arrogance. People hate both. 5. Have a stage presence. Whoever you are speaking to likes listening to a charismatic personality. Personality is a word that is easy to recognize but difficult to define. When a charismatic personality walks onto the room or on a stage, everything brightens up. People start forming opinions within the first 10-15 seconds of just looking at the person even before they say a word. A charismatic personality is captivating, and their confidence without arrogance makes them magnetic. You cannot engage a crowd unless you're confident and magnetic. 6. Be prepared. Practice, practice, practice. There is no substitute for preparation. Audiences can tell whether you have come prepared or not. The audience must walk away with a value addition. They come to listen to you out of trust, they feel cheated if they don't go away with some value addition. An unprepared speaker wastes the audience's time. It literally amounts to breach of trust. Remember, time is more precious than money. 7. Have a strong opener. You have about 30 seconds to grab your audience's attention. If you have not gotten their attention within 30 seconds, you have lost them. The most powerful speakers have strong openers. 8. Have a strong close. Why are strong openers and closes crucial to a good presentation? Because they leave a lasting impression. Impressions remain, while contents are lost. Impressions have a lasting effect. 9. Always close with a "call to action." Every speech or presentation must close with a strong and specific call to action. A call to action makes you a leader; otherwise you are only an information provider. If your speech does not end with a call to action, then you are only a loud speaker not a good public speaker. The above are only few essentials of a good public speaker. The bottom line is good public speaking needs a lot of practice. Just like you couldn't compete at the U.S. Open practicing tennis casually once a month, you can't become a good speaker without constantly practicing. And remember that some of the greatest masters were the greatest disasters when they started. But they made it, and you can, too! Shiv Khera is the founder of Qualified Learning Systems USA. An author, educator, business consultant, successful entrepreneur and sought-after speaker, he inspires and encourages individuals to realize their true potential. He is the author of 16 books including the international bestseller, "You Can Win," which has sold more than 3.5 million copies in 21 languages. For more information, please visit ShivKhera.com.